You remember that rough concept some weeks ago, here's the character model sheet. I've done some optimizing on that wall, less polys thanks to some tips from Jay. 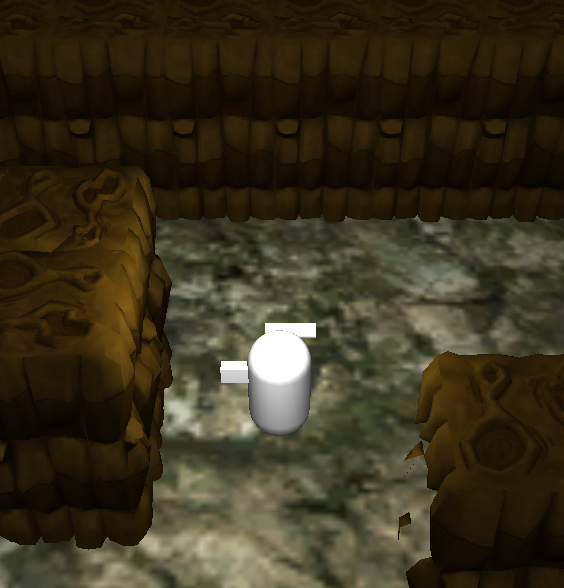 Also have another wall chunket done, have done specular and bump for it, plus bump for that first wall. Currently working on floor tiles. I'll most likely video it all up for Friday. Yes, but just 3 more. 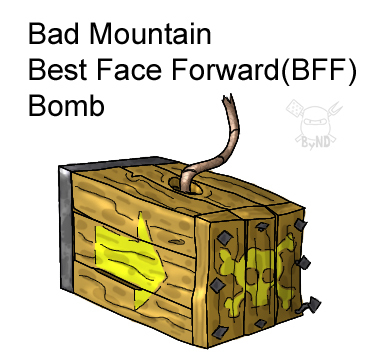 You best face this one forward, the BFF bomb. 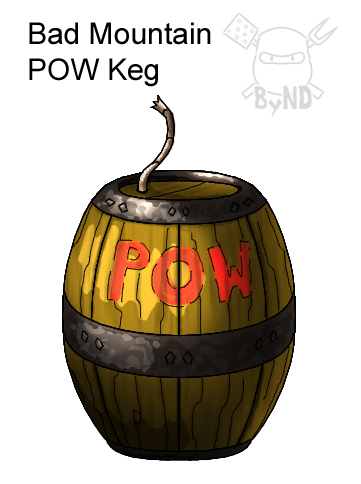 The POW Keg, nothing fancy, just a very large explosion. 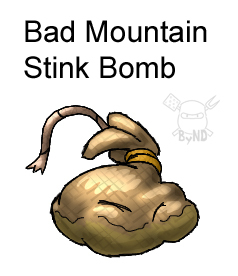 The Stink Bomb. Fling crap everywhere, repels some monsters and humans in general. Also, here's a pic of some wall action. I plan to finish up another wall chunk and then do some floor tiles. Ahhhh I said I was going to do Unity stuff, but was still in a concepting mindframe, so I went with that instead. Here's three tools from the explosives set. The Crossblow! It shoots explosions out in 4 directions. 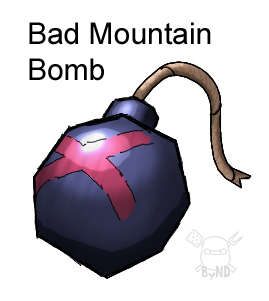 A Bomb. 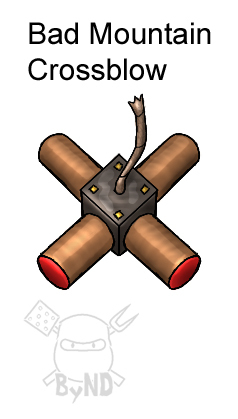 Covers more ground than dynamite, and the blast direction can be effected by walls. Perhaps I'll lay out some floor tile action and start modeling some of that. They're more like special tools that do the same thing, only better, but with limited uses. 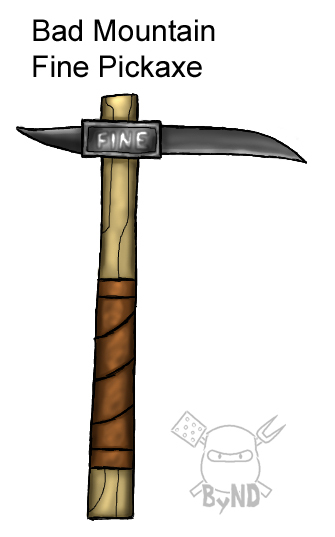 Here's the Fang, a double headed pickaxe, the best digging without sacrificing speed. 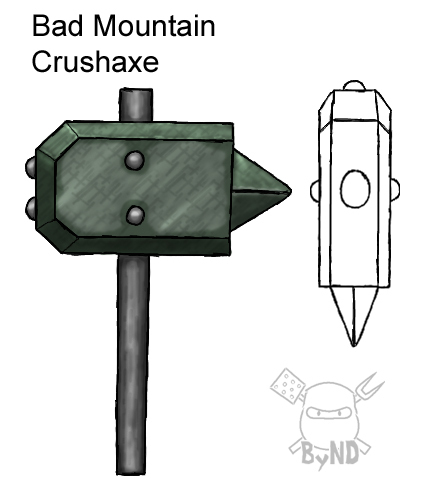 The Crushaxe is heavy, noisy, and powerful. Finally, the Throwing Pick. The weakest of the pickaxes, but you got distance and speed. 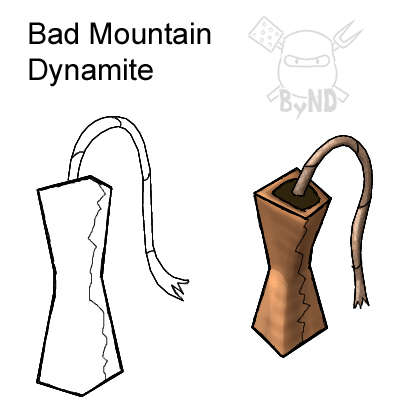 I've already got a round of explosives concepted out, but gotta save some stuff back, don't want the blog content well to run dry. I think the next couple of days I'll return to Unity and scripting. That's what I got. These three serve as your primary digging tools. 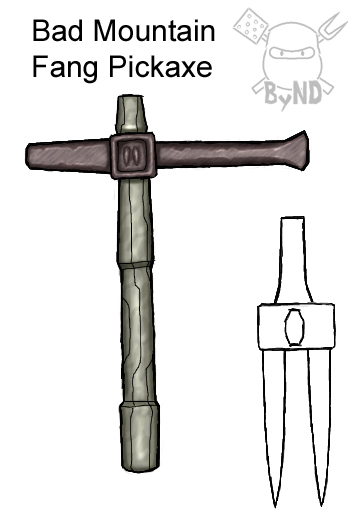 You start with the Stickaxe, but that is replaced with the Old Pickaxe and/or Fine Pickaxe. All are upgrade-able and will never break. 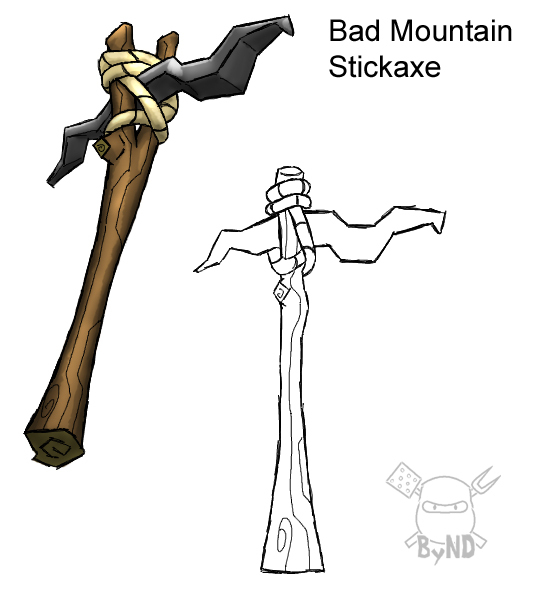 Here's the Stickaxe, it's your starter tool, crappy. 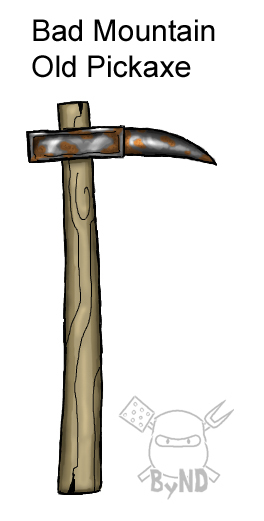 Here's an Old Pickaxe, sorta rusty. Better than a Stickaxe. Then there's a Fine Pickaxe, only one of the finest products brought to you by Fine Co. Oooh, nice leather grip, better than that p.o.s. Old Pickaxe. I'm on to some explosives now. Wheeeeee! He's around 2400 polys at the moment. I've already started drawing up items and I'll most likely do another character before going back to the coding/scripting. 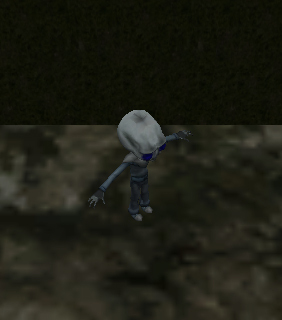 Ok, to test out the model importing in unity, I dug up an old alien I did years ago to throw in there. It's a smooth process for certain, this singular picture is my only proof! 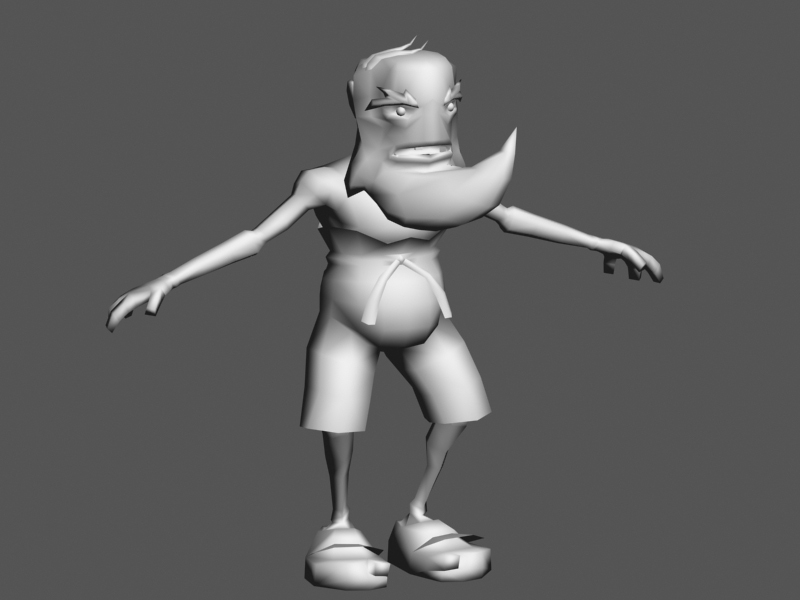 Also, I have completed a model sheet for old Beardy. It's pretty bare bones but will hopefully do the job for now. I want to get a few more things drawn up before going back to the game script itself. 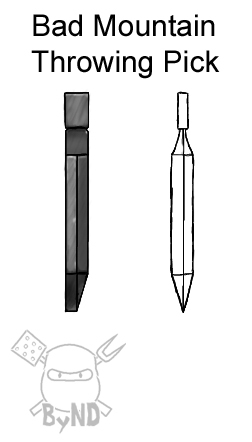 Working on Rabid Cavecoon and some items, such as pickaxes and dynamite. Right, got the collision working on that "pickaxe" action. So the damage numbers are passed and things will happen. Gif on this! Working on some concept art, right now I'm working on Beardy's character sheet. 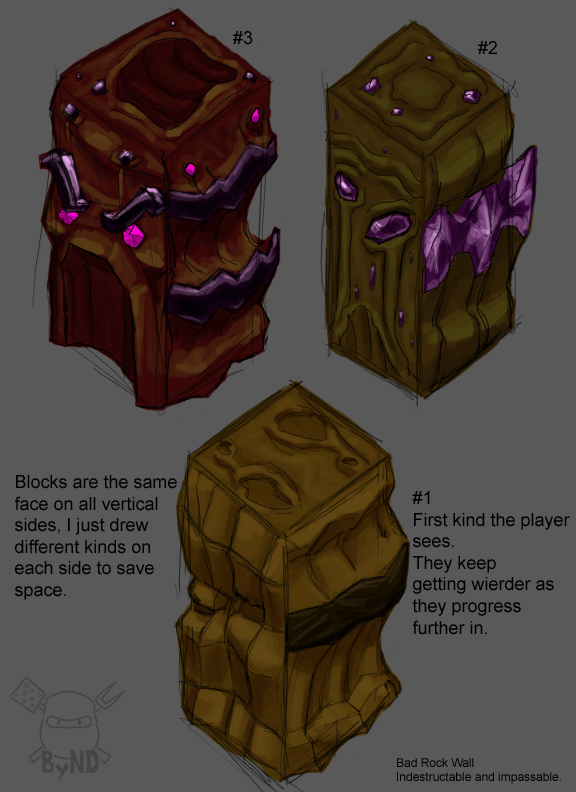 Here's some walls. Not as exciting as the title makes it out to be. I got the player camera working. It sits pretty at the 3/4ths overhead and when sight of your character is obstructed, it swings a little closer and higher to give you and overhead vantage. The movement starts out quick and eases in slow. I have a timer on there also that has to count down before it swings back to normal to keep it from bobbing if you are moving behind segmented walls. There may be changes to how this works later of course, but for now it's good to go. I'll most likely show this off on Friday, so until then. That's me. 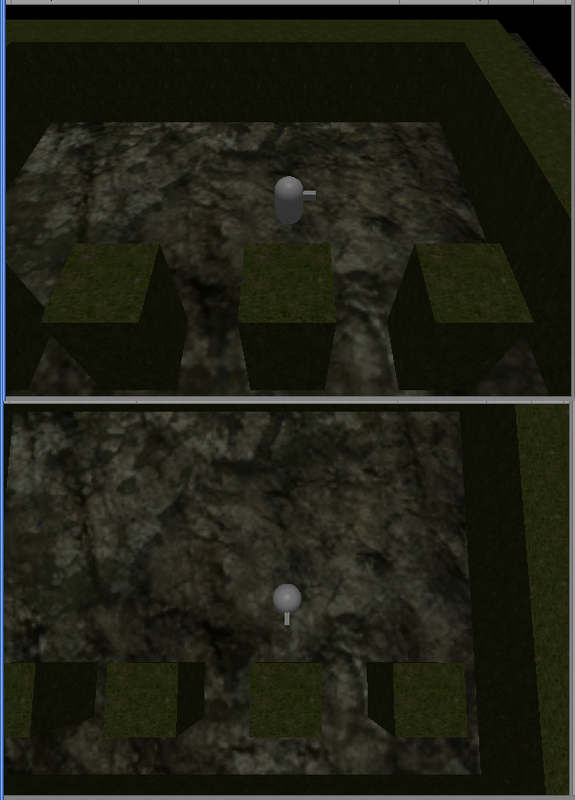 I got the collision detection working. My problem, I was translating the object's position using the Transform class instead of using the CharacterController class. Hurf durf! Anyway, I'll most likely work on the game camera next, get it to change it's position on the fly when a wall comes between it and the player. 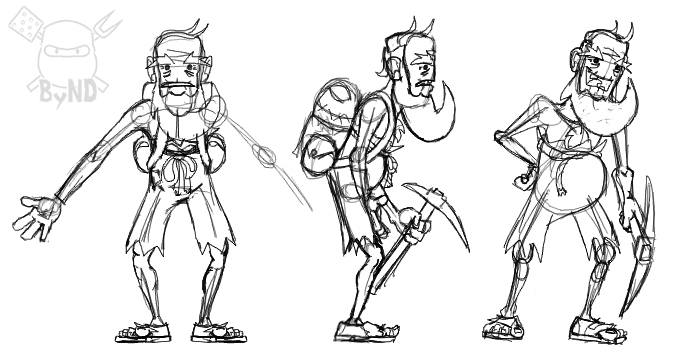 Here's some progress on Beardy, I think the one on the far right is what form I want him to have. I've been working on boiling him down into simpler shapes, there are some small signs of that in this pic. I know you probably can't read a damn thing on that screen, but you can see the player mock up rotate correctly! I should note that the player object has no downward gravity at the moment, and when it did the collision for the ground box didn't work either. Grrrr. I'll give this video thing a try every Friday.